As always, the storm clouds moved on and in their place.......incredible blue skies. If we could only remember this truth.....the sun always shines after the storm. It is a truth in weather as well as life. But honestly, when the storms are raging, and you are in the midst of them, you think the sun will never shine again. Just as many thought winter would be with us forever, spring with her warmth and ferociousness found us. The relief that the storms are no longer with us leaves an emptiness and raw exhaustion. Cleanup is going on in the small towns near us, people putting the pieces of their lives back together as best they can. We drove into Birmingham today for a visit to the eye doc, and saw the path that one of the storms took.......they leave an ugly swath, twisted broken trees, debris, bizarre scars on the face of the earth that take years to heal. The scars they leave on their victims never fade. A beautiful starry night, cool and crisp....a reminder.....that good things do remain. Much gratitude tonight, as bad as last night's storms were, they could have been so much worse. We do have friends whose homes were hit, no one was hurt......though there were fatalities in our state. Rick and I are exhausted tonight, lack of sleep and the sheer fear and stress of the storms has taken quite a toll on us. We appreciate all your prayers and good thoughts, we hope the storms pass you by tonight and all will be safe. Storms are raging here tonight, so far we have dogged their wrath, others not so lucky. 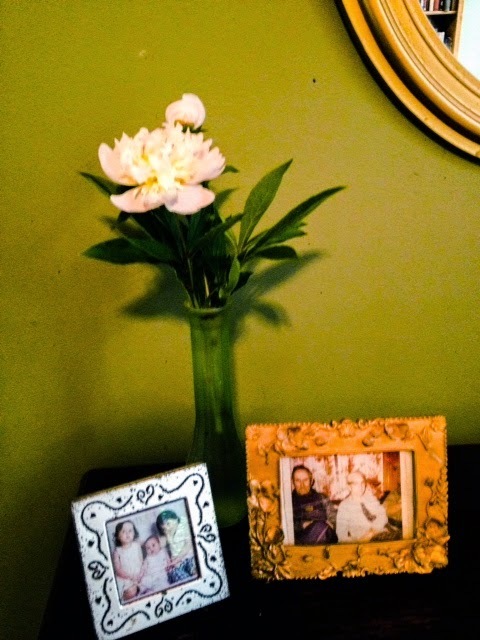 My first peony blossom of the season, she smells heavenly. The plant came from my grandmother Mamie, more than 20 years ago. She and my grandfather, Johnny in the gold picture frame. Blessings of safe shelter for us all tonight. Busy weekend, glad to be winding down.......looks as though we will have a busy weather day tomorrow and Tuesday, keeping our fingers crossed that no tornadoes make an appearance. Finally started the closet cleanup, slowly but surely, winter clothes will be packed and summer ones will be hanging nice and fresh. I think an energy thief has visited our home the past couple of weeks, my energy left and I am not sure where it went. I remember my grandmother Mamie and my mom would cook polk salad and wild green onions in the spring as a tonic to "cleanse our blood" and get us ready for warm weather. Maybe I need to do the same. Of course once, we were out in the woods gathering the polk near a spring and a nasty cotton mouth snake reared its ugly head at me.......after that my polk gathering days were done with a watchful eye. I do know that for me, spring has always been a time of low energy......which I think is interesting, because most of my friends perk up when things warm up. It must be the pollen or the shift in pressure as the storms pass through or maybe both. But I am excited about gardening and doing a little nesting in the house. Wishes for a peaceful week, hoping that the weather gods smile down and favor all of us.......may your Monday be a smooth one with no bumps. The PBS series, Independent Lens showed the documentary Muscle Shoals tonight. If you have not seen this film, watch it as soon as you can.....it is a beautiful piece of work. So many people, when you mention Alabama think of this state as a backwards third world country in the US. But those people don't realize the creative gifts that our state has given the world, especially in music. I watched this film tonight and thought this is why I live here, the world knows the music that came out of Muscle Shoals, but honestly this state pulsates with musical talent.....it is a life blood that flows from town to town......from churches to schools....from bars to coffee houses. In the film they talk about how the music comes from the mud in the Tennessee River that flows through Muscle Shoals, but I believe it is more than that, much more.......it comes from the red clay, the hills, the pine trees, the honeysuckle....it comes from the sweat of coal miners and farmers....the religion that oozes from churches on every corner.....the DNA of Scotch Irish descendants and African slaves. Muscle Shoals is the pinnacle, but the musical talent that is in this state spreads from the sugar beaches on the Gulf of Mexico to the hills in the north.....and all points in between. You can go to any school or church and hear voices that make the hairs on the back of your neck stand up. River banks, family reunions, bars and front porches are all stages for the best music you can ever want to hear. I use to laugh and tell my friends in other places that the humidity and tornadoes here caused a genetic mutant that created all these writers, singers, musicians and songwriters that live here. Many of my friends say it's the alcohol and poverty, that might be true......but I do know that practically every family has a creative vein that runs through its bloodline here in Alabama. that has come from that one little town.....in Alabama, and if you ever visit us, you'll hear great music all across the state. Meeting songwriters is a gift.......hearing their songs, their stories behind the songs is one of the best of life's experiences. We met new songwriters tonight, heard incredible songs......shared stories, laughter and a meal......and knew what we already knew......this is why we do what we do. For many of you, I know that the only time you hear a song is on the radio or tv, or you buy your favorite artist's cd.......do yourself a favor......go hear a songwriters in the round sometime. Hear the songs and the stories behind them, hear the songs straight from the heart of those who created them......hear the raw untouched version of the song, the way it came to the writer before a producer and artist slicked it up. And while you are there, give the songwriter the greatest gift you can give them......listen to their songs and know that they have opened their hearts and bared their souls in front of you. Being a songwriter myself, I know that we don't have that many places to share our talents, that many don't want to hear the unvarnished version of a song......but I can promise you, if you listen to us, let us share our stories and songs.....you have contributed to keeping creative energy alive, you have fed our souls and maybe even your own soul. Meditation classes today......stillness, going inward......a very difficult thing to do, but so worth the effort. I had a brand new student today and a student whose last class with me was today......hello, goodbye. If you have never tried meditation, you are cheating yourself out of so much. The simplest way to meditate......sit and breathe. But there are hundreds of books, and cds and videos, at the library, on line and in book stores.......meditation won't make the hard stuff go away, but it will help you to deal with the hard stuff. Meditation will change your life, but it is a practice......that means you have to practice. Stillness, silence, peace.........we look for it all around us, we try to buy it, we abuse our bodies with alcohol and drugs to find it......but it's in us......just waiting for us to open the door......and all we have to do is sit and breathe. Tomorrow is Friday, blessings for your weekend.......eat some fresh food, drink pure water, sit in the sunlight and feel the breeze......and find five minutes to meditate. It was such a beautiful day today,and I had plans to clean out my closet and plant tomatoes.......but it seems I had forgotten today was the day I see my pulmonary doc.....so off to Birmingham to see the wizard. Just routine tests, and such and good news.......I wasn't better, but I wasn't worse... and stable for me is good. Rick and I had lunch, a nice drive home, and a nap. The closet and tomatoes can wait. Once upon a time, a few years ago.......the closet and tomatoes would not have waited......I would have done everything.......I have learned my lessons well. My days of doing it all are over. I mourned them at first, because my whole life I could do it all......chronic illness laughs at people like me.....and teaches difficult lessons. Life changes.....we can make the best, do what we can and be happy or make ourselves miserable. I choose happy. We can choose to be happy.....it really is our choice. We all face bumps, hills and mountains in the road.....how we choose to deal with those obstacles, well that is how we live our lives. So tonight, I choose to be happy because I am stable.....it could always be worse. Stable means the treatments are doing what they are suppose to do, and I am grateful. That also means treatments continue, after all they are life sustaining......and I am grateful. I hope your hump day was as good as mine......back to teaching tomorrow.......and a gig this weekend. Our bird feeders have become almost as busy as the Atlanta Airport......hummingbirds buzz the front door, the little blue buntings made their appearance this weekend.....this evening there were eight of those brilliant blue birds sitting in the Rose of Sharon waiting patiently for their place at the feeders. We have three types of woodpeckers, ( they love the suet) and cardinals aplenty.......and our first blue jays visited a couple of weeks ago. Rick says I'm feeding the doves so much bird seed that they are almost as big as our chickens. For me, watching those birds feed, bathe and interact with each other is as soothing as meditation. If I can spend a few minutes a day bird watching, life seems to go much smoother. Their chatter and songs create beautiful music and I am astounded by their polite ways. Even the bossy ones know their limit. Thanks for all your kind comments about my anniversary last night. This blogging world is quite an adventure. One of my students thanked me over and over tonight for telling her about an epsom salt soak. Anyone who has chronic pain ( check with your doctor) my student has RA and is an avid golfer and gardener but has suffered with our rainy cool spring.......I mentioned to her a couple of weeks ago, about how wonderful an epsom salt soak could be. She told me tonight, she has been taking about three per week and it has helped her pain. So here's the recipe......take a three pound bag of epsom salts, add a few drops of lavender oil or any other essential oil you like, mix in a large container with a lid......fill your bath tub with warm water, add two cups of the salts......soak for about 10 to 15 minutes. Epsom salts is basically magnesium ( a natural muscle relaxer), I do a soak about three times a week and all I can tell you......it works. I can be sore, stiff and in pain or so fatigued I can't sleep.....an epsom salts soak gives me a goodnight's rest and eases the pain and stiffness. You can mix the lavender with eucalyptus, tea tree, jasmine.....any essential oil. Lavender works well for relaxation, and eucalyptus is wonderful if you have a cold. I have done these soaks at night and during the day. Monday is almost over, I hope the rest of your week brings sunshine and good news. Today is a milestone for me......four years ago on this date, I became a blogger. Honestly, I didn't have a clue, Rick ( my hubby) pushed me into this. I thought I would write a few months, maybe a year at the most and that would be it. But something happened.......I found connections, I found a voice, and I found new friends. I was so unsure of myself......yet I continued ........many times, I have thought about quitting. But here I am, a blogger for four years. I hope, I pray that my words or at least some of them have meaning. I have tried to be open and honest, to share my thoughts and lift some spirits. This has not been an easy path......especially after my treatments started.....that is when I really wanted to quit. But this blogging in many ways became an extension of my teaching and that is when it began to click for me. Not that it would become a yoga class, at least not one of postures......but that I could share how yoga has worked in my life and my students lives. And then came the treatments......and I realized that how many people just in my world sat in those big green chairs......how those chairs changed my world and everyone else who has ever sat in them. I understood that it was ok to share the world of green chairs, it was ok to talk about it. life on a small Alabama farm, the world of big green chairs, and everything else in between. I am grateful tonight, that you read my words, that you share your comments and you lift me up when I am very low, and share my joy when it fills my heart. I pray blessings of good health, joy and peace for all of you tonight. Thank you for a wonderful four years. but when you look in their eyes......there is no life, no joy, no hope. This is Easter weekend and for Christians, this is the weekend of hope, the weekend of life eternal. I don't know my friend's family's beliefs, I have suffered loss, but not this much in such a short time. So, I ask you tonight, say a prayer, send good thoughts, send love to my friend, Robbie's family. May the rest of your weekend bring Peace. Rainy and cold, yet everything is so green and lovely.......I think I have thought about Ireland so much the past few months that I have somehow brought their weather to Alabama. I have heard so many complain about our cool rainy spring, but this spring has been the calmest one we have had in years......we're talking calm tornado wise. I will wear sweaters and jackets until June if that is what it takes to prevent the violent storms that we have had in years past. As far back as I can remember the Easter season has always brought violent storms.....this year has been different and I am so grateful. I am sure many of you are getting ready for egg rolls and egg hunts and family gatherings....Easter frocks and baskets and bonnets are waiting for their moment. Easter has always been a mixed feeling holiday for me.......I liked the baskets, hated the ruffled dresses......I like to dye and decorate eggs, hated to hunt them....Easter was the first time I shaved my legs, there were many band-aids under my first pair of nylons. I loved the little chicks and ducks that we use to get when were kids.....of course, I understand why that is no longer a custom, I probably single handedly caused that fiasco. The one Easter that I got a duck was not a happy one.......I thought the duck was thirsty, I stuck his head in a bowl of water, well.......he drowned. Safe travels to you who are on the road this weekend, enjoy your traditions......and remember, ducks just don't get that thirsty. My last class this afternoon was special........usually I have 15 or 20 students, but today there were only six. It was interesting as they came into the room, you could feel the intent......you could feel their need.......they were seeking. I tossed aside the plans I had made for that class, and taught straight from the heart......watching as they moved through the asanas, feeling the energy in the room change. The last posture we did before relaxation was supported fish......their bodies seem to melt into the pose. I watched stress leave their faces. I played one of my favorite cds, something called Zen......and it is very Zen like. As the sound of flutes and chimes and cello drifted through the room, they eagerly got ready for savasana. As I began our guided meditation, breaths slowed, muscles relaxed and I watched as each one allowed their breath to take them where they needed to go.......a couple fell asleep, the rest were in that magic place between awake and sleep, deep relaxation. When class was over, each student remarked about how much they needed the class today, and each one told me how the class gave them what they needed. As a teacher, those are the moments you teach for.......to share the breath, the movement, the meditation and know that the students "got it". A couple of them shared remarkable insights that had come to them the past few days in class......some days, I wonder why I teach.....today I knew why. No agenda....... last night I mentioned to Rick that we had nothing on the calendar for today, nothing on the day planner. No agenda......such a rarity for all of us. We had a late breakfast, walked the dogs, read the papers, late lunch, played guitars, I worked a little on our performance schedules.....we pretty much did whatever crossed our minds. It was wonderful. No agenda......it is a luxury. But, I think it is luxurious necessity......it is really a mental health day. A day to do as you please, to allow your mind to slow down and follow your bliss. We all need these days.......we need the rest, the quiet, the freedom. It seems at times we are all slaves to something......the clock, the calendar, the schedule. The freedom of one day, one twenty-four hour period to to do what you want, even if it's nothing at all......that is what our bodies and our minds crave. No agenda......I know, most days none of us can afford it.......but every once in awhile, you have to splurge. You have to do this for yourself. Spend the day watching movies, reading a book, sleeping, walking, talking with friends......but don't plan it, fly by the seat of your pants. No agenda.....it's decadent, and I admit....there was some guilt. But this afternoon as Rick and I sat on the deck, enjoying the sunshine and blue skies, he looked at me and said, "what a great day this has been." No agenda......take a day, a half day.....wow, I can dream about a week. Your body and your mind will thank you, those around you will thank you......and the stress levels will drop. No agenda......who knows when the next one will be......but I can't wait. I know that some of you got snow today.......everything is blooming here and the temps are dipping down into the 20's tonight. Our dogwood is massive, it fills one side of our front yard. This evening as I entered our driveway, the beauty of this white cloud of flowers took my breath......I love when it blooms at Easter. My wish tonight.......sunny days and warmer temps for all who have endured the endless winter. 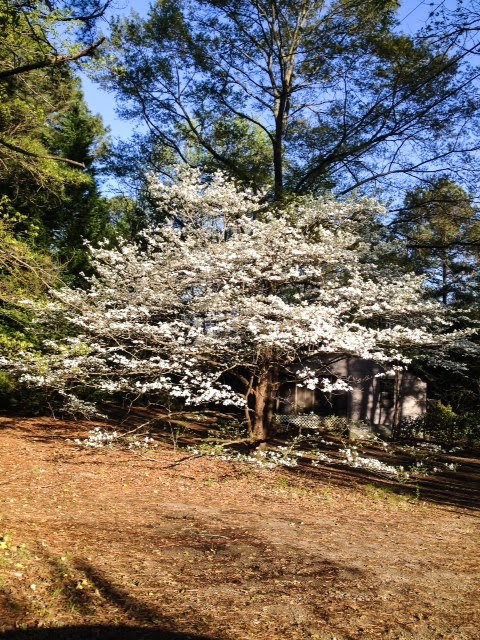 I hope our blue skies and dogwood blossoms brighten your day. Good news, bad news day. At least it wasn't all bad, and I am grateful.....but, I am exhausted tonight. First day back at work after last week's treatment. Hoping the clouds move along and we get to see tomorrow night's full blood red moon. We met our friend Jan for lunch today. She lives in Michigan and we rarely get to see her. The scarf she is wearing in the photo was mine. As we stood outside the restaurant, she mentioned how much she loved my scarf that I was wearing. She also mentioned that her late husband Tim ( our friend from high school) had bought her scarves. I told her that I had my mom's old scarves and every time I wore one of them, I felt a hug from my mom. As we said our goodbyes, I felt compelled to take my scarf off and wrap it around her neck. It just seemed like the right thing to do. Now, every time she wears that scarf, she will get a hug from me. I think it looks beautiful on Jan and I know Tim would have loved it. A friend called me tonight......it had been awhile since we had talked and she had gone through a most difficult time......but as we talked and laughed, I knew her time in darkness was over.....there was music in her voice. After we talked, I thought about her and the storms she had weathered......I thought about other friends and their storms.......and I thought......I want to hear music in all of my friends' voices. I have heard that joy, that giddiness in two phone calls this week........and it fills my heart with gratitude. We all deserve joy, we all deserve giddiness and laughter and musical voices. sake, don't think that you deserve them, don't think that life is nothing but bumps in the road. On this Saturday night, my wish, my prayer for you......that sometime tomorrow, there will be music in your voices.....that your friends will feel your giddiness and be grateful for your joy. "A Lamp in the Darkness"
A few months ago, a student gave me a book, " A Lamp in the Darkness" (illuminating the path through difficult times) by Jack Kornfield. I had it and several others in a stack to read. I took it with me yesterday and read the first couple of chapters.......today I finished it. I am a true believer that timing is everything.......and it was time for me to read this book. There are so many profound words about healing in this book......today as I read it, I found the comfort and hope that I felt had been lost yesterday. Chapter nine, begins with a prayer that the Dalai Lama is said to to pray every morning....... from this day forward, it will be my prayer also.......and I hope it is yours as well. "May I be a guard for those who need protection; a guide for those on the path; a boat, a raft, a bridge for those to cross the flood; may I be a lamp in the darkness; a resting place for the weary, and a healing medicine for all who are sick. For as long as Earth and sky endure, may I assist until all living beings are awakened." There is not a one of us who hasn't or will not go through hard times.......death, illness, loss, betrayal.....but I believe we make it through because someone becomes our guard, bridge, lamp, resting place or medicine. We cannot make it through this life without each other. Blessings of peace, healing and love to you all this weekend. #28......there must be some strange activity in the stars and planets, everything seems a little topsy turvy. Treatment #28 today, met my new doc today. and a strained intimacy.......he has seen my records, he knows everything about me, I know nothing about him......except he has six kids.....busy man. I missed my chair buddy today, I missed my friends that make my very long day not so long. Even Rick was busy today and couldn't hang out with me. I made new friends, I always do. It has been one of those weeks when I don't feel present, I seem to be more of an observer than participant. The nurses were so busy today, no chats, no laughter. A long day seemed even longer. This quote shouted at me tonight. I heard an unsettling rumor this evening......which considering the source, is not a rumor.......and I began to worry......until I remembered this quote. At least now, for a while, I can use my energy for something else and not worry.....because the truth is if it's going to happen it will. Fatigue has overcome my body and my brain tonight. we all hit bottom. It's what we do after the drop that defines who we are and where we are going. I spoke with a good friend tonight, who had gone through those hard times this past year......but tonight, her voice was giddy with excitement and joy. She has gone through the dark valley and the sun is shinning on her once again. By the time our conversation had ended, I felt as giddy as she sounded. Working at an addiction center, I see my share of life at the bottom, of broken dreams and hopes that have disappeared. But, I also get to witness those first moments of sunshine coming through the darkness......to see hope and faith reappear. I see students come through my door, never smiling.....and then one day they walk in and their eyes have life and sparkle and a smile breaks across their face.....and I know in my heart that healing has begun. of what life is......the costs, the pain, and finally the break through of joy.......the giddiness if you will of knowing that you made it through and that life is good. My wish tonight, that at some point this week, we all experience the giddiness, we all make it through and if only for a few moments......that life is good. I have had so many talk about their lack of energy the past few days.......I am right there with you. Mine is because treatment takes place in a few days, but I think the rain and chilly temps are stressing our bodies. The days are longer, the flowers are blooming, the trees are green.......our bodies expect warm sunny days. The good news about our weather.....no tornadoes. Honestly, I will take the chilly temps and rain any day over tornadoes. And in the words of one my students tonight......."I can always wear more clothes to stay warm, but you can only take off so many when it's hot." In the mid- 90's I read a book, "Your Best Year Yet" by Jinny S. Ditzler. It was really more work book than reading book, but I had read a magazine article about it and decided I should give it a try. There were ten questions that you answer, the whole process takes about three hours and the author suggests you do the workshop with a friend or family member. The first time, I did it by my self. The answers surprised me.......it was an eye opening experience and it truly helped me on my path. A few years ago, Rick and I did the workshop together......once again it was an eye opening experience. I pulled the book off the shelf tonight and read those ten questions.......I walked into the office, looked at Rick and told him it was time to do the workshop again. I'm not going to tell you all the questions, but what impressed me from the very first was the first question. Many self-help, motivational books are quick to point out your weaknesses, this one is different. Question # 1 WHAT DID I ACCOMPLISH? It is amazing to sit down and write out your accomplishments from a year ago........I promise, we all need to do this. Once you realize that you did not waste a year of your life, that there were accomplishments......the questions that follow, the inward journey you begin is easier. This book might not be for you, but if you are at a crossroads or a time in your life when you need to re-examine, I urge you to read it.......or at least answer the ten questions. It is a common sense approach to living the life you seek, it's not magic but it helps you to realistically find ways to have "your best year yet." wishing you all a Monday that starts your week with smiles and joy, may we all have "our best week, best month, best year yet." Flu has hit my family hard this week.......Jordan came down with it last Saturday, his mom and our nephew Haven both tested positive yesterday. I am washing hands, spraying Lysol, doing voo-doo hoo doo and saying prayers that no one else gets it. It is typical flu, body aches, high fevers, coughs.......I feel so bad for them. It has been a beautiful spring day. We moved all the plants and trees outside today, they were beginning to look a wee bit sad. They were ready for fresh air, sunshine and rain. Rick did yard work, so he might just move a little slow tomorrow. My older brother Lynn came for a visit today. He lives a couple of hours away so we don't see each other as much as we'd like. He builds furniture, tables, benches.......the rustic kind, made from old barn wood. He is quite the craftsman and always has a waiting list for his creations. We spent as much time outdoors as possible today, rain is moving back in tomorrow......actually a monsoon of sorts, three inches are predicted. Have a peaceful Sunday.....don't think about Monday. We awoke to thunder, wind and rain and a call from our local weather station telling us straight line winds were headed our way.......that was at five this morning. Thankfully, other than a few tree limbs blown about there was no real damage. I believe I mentioned earlier this week about not being envious of our lovely spring weather that we would pay for it. More of the storms headed our way Sunday. Calliou does not handle stormy weather with calm, he paces, he tries to get in bed with us and when all else fails, he gets in Rick's shower. Our new dog, Taz never blinked an eye when the storms rolled through this morning.....she seemed a little miffed that we were getting up at the crack of dawn......though she did bark when when heard things blowing around on the deck. As we walked today, I was amazed by the difference a few days had made........Monday there were bare trees and a hint of flowers blooming, today.......you can see green in all the trees, the dogwoods have bloomed, the pine pollen has arrived and there is a carpet of wild violets in front of the old farm house. When Mother Nature decided to welcome spring, she wasted no time. A low key weekend for us, next week is treatment week......so my "juice is low". Wishing you all a weekend of sunshine, and at least a quick hello from spring. Strange day at work, our director had assigned me a new sub to teach my classes when I have a treatment and can't make it in. The sub came to my classes today to observe me and learn her way around the building. By the second class, students were coming up to me with shocked faces asking me to "say it ain't so." I had no clue what they were talking about, and finally one of them told me...it was going around the facility that today was my last day teaching. I laughed, rather nervously and told them I had no plans to go anywhere, but maybe they knew something I didn't.......tomorrow is payday, pink slips are usually given out on paydays........I hope I don't get one. Wow, what a weird thing to happen......a very weird thing to deal with. running engine......well, there was no smoothness to it. Rick's truck is in the shop too, there must be some bizarre planetary alignment. So, that was my day.......I sure hope yours was better. 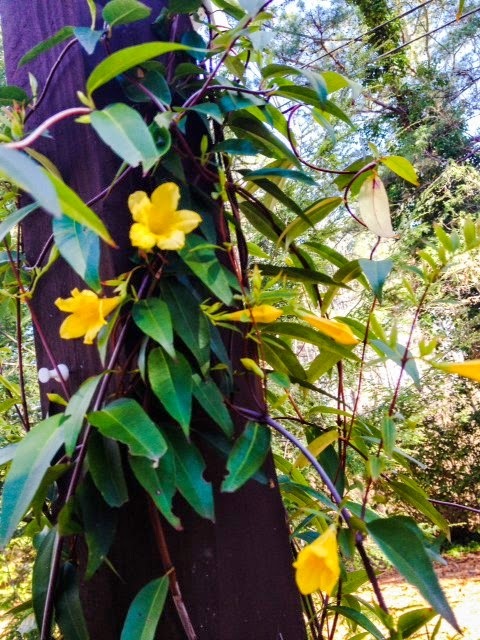 Yellow jasmine blooms on our arbor today.......and our first humming bird of the season appeared at our window this morning. Almost 80 degrees today, but don't be envious......a threat of severe storms coming at us Sunday night.....and the pollen count is already off the charts......we pay dearly for these warm spring days.